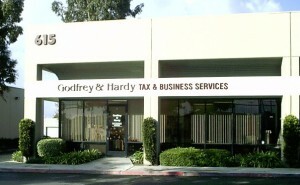 Contact | Godfrey and Hardy Tax & Business Services, Inc. Located in the industrial center at the North West corner of Benson Avenue and Arrow Route. Take I-10 West to Mountain Avenue, turn right (north) on Mountain Avenue to Arrow Route, turn left (west) to Benson Avenue. Turn right on Benson Avenue (north) and turn left into the first driveway. Take I-210 West to Mountain Avenue, travel south on Mountain Avenue to Arrow Route, turn right (west) to Benson Avenue. Turn right on Benson Avenue (north) and turn left into the first driveway. Take I-10 East to Central Avenue, turn left (north) on Central Avenue to Arrow Route, turn right (east) to Benson Avenue. Turn left on Benson Avenue (north) and turn left into the first driveway. Take I-210 East to Baseline Road. Turn right and travel east on Baseline Road to Benson Avenue and turn right (south). Stay on Benson Avenue (south) to our office, once you pass the signal at 11th Street and before Arrow Route, watch for the complex on your right.